Tom Nook's kids are running their own shops in Animal Crossing: Jump Out. The world of Animal Crossing is about to get even bigger. Animal Crossing: Jump Out, the series' first installment on the 3DS, is adding plenty of new locations and activities to the long-running life simulation franchise, and a few more of these features were detailed in the latest Japanese installment of Nintendo Direct. 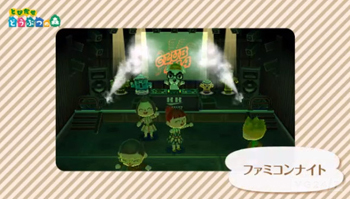 Among the most interesting: shops run by Tom Nook's offspring, a revolving sushi bar, and a club in which K.K. Slider trades his guitar for a turntable. Tom Nook will still be around to make sure you pay off your mortgage, and his furniture store will be located in a city north of the town where you reside. His children also run shops, though no word if they'll also be collecting your hard-earned bells. You can now buy gardening accessories in addition to furniture, allowing you to decorate the exterior of your house as well as inside, and one of the garden items shown off was a Super Mario Bros. fire flower, which is sure to complement your well-tended plants. Other new shops include Shoe Shank, a footwear store run by a skunk. If you're looking for activities beyond shopping, you can check out the revolving sushi bar in the aquarium, take some snapshots in the photo booth, or head to Club 444. It's here that K.K. Slider, a mellow acoustic guitarist who puts on Saturday night concerts, becomes a DJ with an accompanying light show. Don't worry about getting lost, because a new mini-map will help you find your way around. And finally, if you're looking for a way to communicate, the new megaphone lets you shout at residents through your 3DS microphone. This should make it easy for you tell visiting players not to chop down your cherry trees, you just imported those cherries! All of this information is encouraging, and it sounds like Jump Out is going to add more to the series than any game before it. Animal Crossing: Jump Out is due out later this year in Japan, but North American and European gamers will have to wait until 2013 to become indebted to Tom Nook.